First and foremost, lets separate the funding of communication networks from the funding of content. There is not, and never has been, a funding gap in data communication network commercial models. Data communications networks are funded by end user subscription, with charges based on the volume of data and speed of the service offered. Network operators charge one another interconnect fees for the balance of incoming and outgoing data traffic. There may also be income from wholesale agreements, or partner service providers. Charles Dunstone (CEO of Carphone Warehouse) recently appeared in a BBC Radio interview describing the broadband business as a 'business of scale'. Answering the question "is it possible to make money?" he responds, "Yeah we've invested a lot of money in TalkTalk but it does now make money as a business. It is forecast to make £150M this year, and generate about £100M of cash flow... So yes we are because: we have a very efficient network ,we charge people a price that gives them great value, but on the scale that we're operating at we're only making a small amount per customer but we have a lot of customers". BT Retail, in the annual report for 2009, stated that operating profit was £1.2Bn (up from £1Bn in the preceding year) despite falling revenue and declining market share. Only some of the content available over the internet is ever funded by advertising. Of the content that is funded by advertising, only a small proportion is funded by any given advertising network. Many sites sell their own advertising without help from ad networks. Could Phorm fund a new infrastructure for the UK? Even the most optimistic forecasts back in April 2008 by Investec (reported in the NY Times) claimed BT might make £85m per year. To contrast, upgrading BT's UK broadband network to bring fibre close to just 40% of homes in the UK by 2012 has been estimated by BT to cost £1.5Bn (reported on BBC). And only 10% of those homes would actually be cabled with fibre. What about the remaining 60% of UK homes? The Broadband Stakeholder Group (reported in The Telecom and Times) estimate that it would cost £5Bn to provide fibre to all UK street cabinets, or £29Bn to connect all UK homes with fibre. 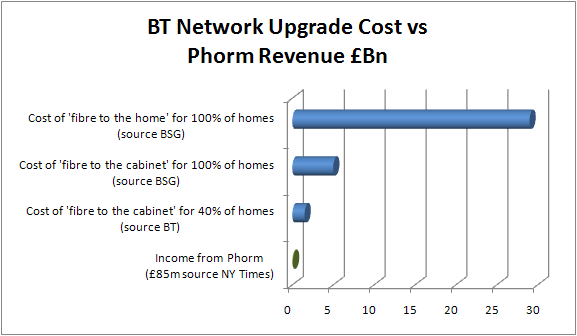 Even using the most optimistic estimates, Phorm would constitute a drop in the ocean of the money required to upgrade the entire BT network. It would take 300 years for Phorm to provide enough money to bring fibre to all UK homes. Phorm would require a large proportion of BT Internet customers to sacrifice their communication privacy for very little benefit; BT would make around £1 per customer per month. Phorm (and similar systems like KindSight, FrontPorch, Adzilla, NebuAd) could only ever fund a tiny proportion of the content on the internet. Web sites funded by other means, their content, and their private communications with users would all be used without consent or licence to make Phorm profitable. Phorm will exploit the creative talents of the people who own the bulk of the content on the internet without paying for a copyright licence. Even if it were legal to operate, Phorm Webwise would contribute very little to the cost of infrastructure investment.